Last week I hosted nine Bella Michele Jewelry E-Parties in 1 week. Add on two displays for private parties, which makes me doubly insane. In between, we've been escaping to the beach as much as possible because child #3 starts to hyperventilate if his feet go more than 3 days without touching the ocean. This week while I hammer away at jewelry and skip cleaning my house, Brian is not at the ocean but at skateboard camp with his friend. It's not the ocean, but it's fun...though I did promise a quick trip tomorrow after camp. School starts two weeks from Thursday for the younger boys...the college boy is moving back on campus this week. I can honestly say I am sad to see summer come and go but I am thrilled that Fall is right around the corner! I have to comment on your display. 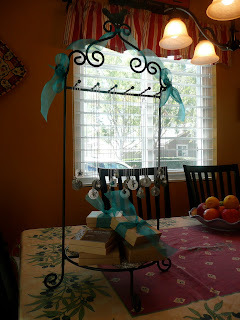 When I was doing craft shows, I used a black iron coffee mug tree to display ornaments. Looks like your basket holder does the trick for necklaces!